1Institute of Biochemistry and Microbiology, Faculty of Sciences, University Austral of Chile. Casilla 167, Valdivia 5090000, Chile. *Corresponding author: paola.diaz@postgrado.uach.cl 2Institute of Environmental and Evolutionary Sciences, Faculty of Science University Austral of Chile. Casilla 567, Valdivia 5090000, Chile. 3Severo Ochoa Centre for Molecular Biology (CBMSO), University Autónoma of Madrid, C/Nicolás Cabrera, 1. 28049 Madrid, España. Yeasts play an important role in nature, and soil is one of the largest reservoirs of yeasts. Seventy-seven yeast strains were isolated from southern Chilean volcanic ash soil. These 77 strains were composed of 30 strains derived from soils used as permanent grassland, 30 strains from rotating grassland, and 17 strains from native forest (considered as the control). These strains were identified using restriction fragment length polymorphisms (PCR-RFLP) in conjunction with ITS-5.8S rDNA sequencing. Additionally, a physiological characterization of the assimilation of carbon and nitrogen and the fermentation of sugars was performed. Various features of the strains were evaluated including their growth in vinasse medium, nitrogen and phosphorus content, and lipid production. Lastly, the use of strains as biofertilizers was analyzed via the cultivation of bell pepper seedlings in soil. From the RFLP profiles, the 77 strains clustered into 10 groups. Of these, only three groups could be identified to the species level, and another was classified to the level of genus (Devaryomyces hansenii, Pichia fermentan, Kazachstania exigua, Candida sp.). All strains grew in vinasse medium. Six strains (PP1, PP4, PR4, PR10, PR27 and PR29) showed a high capacity to accumulate lipids, and three strains (PP1, PP21 and PR28) have the potential to be used as biofertilizers. The conditions found in soil facilitate the development of certain species of yeast; thus, a high diversity of yeast contributes to the soil microbial community (Wuczkowski and Prillinger, 2004). The diversity of yeasts in soil has been examined globally from Antarctica to tropical regions (Slavikova and Vadkertiova, 2000), and soil type, climatic features, and anthropic disturbance have been found to influence the presence of yeasts in soil. Recently, several studies have demonstrated how human activity influences the diversity and community structure of yeasts in soil. Slavikova and Vadkertiova (2003) compared yeasts in soils where different crops (maize, beet and potatoes) were grown versus non-tilled soils and determined that there is a decrease in yeast population in cultivated soils likely due to the use of pesticides and fungicides. Yurkov et al. (2012) analyzed yeast diversity in soils whose use had changed from forest to pasture, and they found that pasture soils preferentially harbor Ascomycete yeasts as opposed to forest soils where the community structure is more heterogeneous. The economic potential of yeast to agriculture, medical, or environmental applications warrants their molecular identification. Currently, molecular barcoding employing rDNA genes or the internal transcribed spacer (ITS) is the most common technique used to characterize yeast (Pham et al., 2011). Molecular barcoding is fast, reliable, accurate and therefore, suitable for rapid screening of isolated strains. It has been shown that ITS regions (non-coding and variable) and the 5.8 rRNA gene (coding and conserved) may be useful for the measurement of phylogenetic relationships since these regions present high intraspecific differences (Fernández-González et al., 2001). Currently, there are various applications for the use of yeast in industry including in the production of biofertilizers and lipids. Biofertilizers are composites of beneficial microorganisms, which, after application, can increase nutrient availability and thus help improve soil health (Kupper et al., 2006). Given that many agricultural systems are characterized by low efficiency in the use of nutrients, agricultural practices that minimize the excessive addition of N and P are urgently needed in order to ensure sustainable food cultivation Yurkov et al. (2012). El-Tarabily and Sivasithamparam (2006) note that yeast taxa have been registered as plant endophytes, as promoters of plant growth, as producers of enzymes (e.g., β-1,3-glucanasa), and as agents of biological control. Additionally, Ignatova et al. (2015) have shown that yeast directly or indirectly provide beneficial services to plants. Some of these services include nitrogen fixation, the production of plant hormones such as auxins, gibberellins, and cytokines, the synthesis of vitamins, the production of antifungal and antibiotic compounds, the ability to solubilize minerals such as phosphorous, and the capacity to degrade numerous chemically toxic substances. Additionally, yeasts have been reported (Chang et al., 2013) as the most promising species for the production of lipids. Specifically, the high intercellular lipid accumulation (up to 80% of cell dry weight) of some species, namely Rhodosporidium sp., Rhodotorulasp.,Lipomyces sp., and Yarrowia lipolytica, make them very useful for the production of fats (Rakicka et al., 2015). Many of these yeasts accumulate lipids in the form of trialkylglycerols (TAGs), mainly in the cytoplasmic membrane, and the production of TAGs increases during nutrient limitation (Arous et al., 2015). Currently, research on the accumulation of yeast lipids and lipids generated by other oil-producing microorganisms is mainly focused on: (i) optimizing pilot-scale lipid production including residual raw materials as a source of energy (Polburee et al., 2015), (ii) the search for strategies in the culture to optimize the lipid production process and (iii) the determination of metabolic and molecular aspects involved in lipid accumulation (Ledesma-Amaro et al., 2016). The objective of the present study was to identify and characterize yeasts that are present in volcanic ash soils in the Los Rios Region of Chile. Furthermore, we evaluated the biotechnological potential of these yeasts by growing them in an industrial waste liquid known as vinasse. Samples were collected from various sites with volcanic ash soil (Hapludands) in the town of Marquina, Valdivia, Chile (673.75° E, 5625.5° N UTM, Quadrant H18). Specifically, 400 g samples were collected from the first 10 cm of the soil. The sample sites included permanent grassland (PP), rotating grassland (PR), and native forest (B) that was considered as the control. Two samples were randomly collect from each site. The soil samples were deposited independently in sterile plastic bags and transferred to the Mycology Laboratory of the Institute of Biochemistry and Microbiology of the Austral University of Chile. Isolation of yeasts was done by serial dilution whereby 10 g of the respective soil samples were weighed and placed in a flask. Then, 90 mL of sterile distilled water was added, and the obtained mixture was shaken manually until total dissolution of the soil was achieved. Following this, 1 mL of the mixture was extracted using a sterile pipette and placed in a tube containing 9 mL of sterile distilled water (10-2 dilution). Hence, dilutions were made up to 10-6. Subsequently, 1 mL of the respective dilution was deposited in an empty Petri dish to which 0.5 mL of antibiotic mixture (penicillin and streptomycin 1: 1) and 15 mL of Sabouraud agar were added. Once the agar had solidified, the plates were incubated at 23 ± 2 °C for seven days. After the incubation, 30 yeast colonies were selected for each grassland site, and 17 colonies were selected for the control site. Colonies were selected using morphological criteria, including the color and the size of the colony. Overall, 77 yeast strains were selected for downstream analysis. Each strain was characterized using the traditional methodology proposed by Barnett et al. (2000). Using an auxanogram, we determined how the yeasts used different carbon sources (succinic acid, citric acid, starch, cellobiose, Arabinose, D-glucitol, D-mannitol, D-xylose, D-ribose, DL-lactic acid, Galactitol, Galactose, Glycerol, Inositol, Lactose, L-aravinose, L-Rhamnose, L-sorbose, Maltose, Melibiosa, Melizotosa, Rafinosa, Ribitol, Sucrose, Trehalose). Specifically, 0.5 mL of yeast suspension (McFarland 0.1 turbidity = 102 CFU yeast / mL) was mixed with 10 mL of Yeast Nitrogen Base (YNB) agar, and the obtained mixture was deposited in a sterile and empty Petri dish. Once solidified, the selected carbon sources were deposited at four points that were equidistant from the plate edge. Glucose was used as a control. Following additions, the plates were incubated at 23°C and examined every two days for one week. The qualitative growth of the yeast strain was given as positive (+), weakly positive (+/-), or negative (-). Nitrate, nitrite, and urea nitrogen assimilation was also tested by changing the base medium to Yeast Carbon Base (YCB) agar. Additionally, fermentation was evaluated. Specifically, glucose was used as a positive control, and the following were added at a 2% final concentration: Starch, D- Galactose, D-xylose, Fructose, Lactose, Maltose, Sucrose, Trehalose. As with the broth culture medium, 0.1% of yeast extract broth was used. To this, the sugar to be evaluated was added at a 2% final concentration. Overall, 3 mL of culture medium and 1.5 mL of the sugar to be tested were added to individual tubes. Then, 0.1 mL of the respective yeast suspension (at McFarland 0.1) was added to each tube, and then these were incubated at 23 °C for one month. Each day, visual checks for turbidity and gas in the Durham tubes were performed to determine whether fermentation was occurring. The same yeast isolates used in the metabolic analyses were also cultured in Yeast Peptone Dextrose (YPD) for 30 h at 25 °C. Following this, the DNA of the strains was extracted using an E.Z.N.A.® Yeast DNA Kit following the supplier's instructions. The 5.8S-ITS region of the nuclear ribosomal DNA (rDNA) was amplified using the ITS1 primer (5’ TCCGTAGGTGAACCTGCG G-3´) and ITS4 (5´ TCCTTCCGCTTATTGATATGC G-3´). Additionally, the 5.8S-ITS region and partial 26S gene of the nuclear ribosomal DNA (rDNA) was amplified using the ITS1 primer (5’ TCC GTA GGT GAA CCT GCG G 3´) and NL4 primer (5´ GGT CCG TGT TTC AAG ACG G 3´). The PCR reaction was carried out in 25 μl which was composed of GoTaq® Green Master Mix (Taq DNA polymerase, dNTPs, MgCl2) (Promega) and 0.5 μl of the forward and reverse primers. Amplification conditions for the first primers, ITS1-ITS4, were: initial denaturation (2 min at 95 °C), final denaturation (1 min at 95 °C), annealing (2 min at 56 °C), extension (2 min at 72 °C), and final extension (10 min at 72 °C). For the first ITS1-NL4, the conditions were: initial denaturation (2 min at 95 °C), final denaturation (94 °C for 1 min), annealing (40 s at 52 °C), extension (1 min at 72 °C), final extension (10 min at 72 °C), each for 30 cycles. 4 μl of the PCR product were analyzed on 1.5% TAE 1X agarose gels and visualized on a FOTO/UV21 Transilluminator. A 100-bp DNA molecular weight marker (Thermo Scientific) was used. The DNA concentration was measured on a Nanodrop, Infinite M200. The amplified DNA was purified and sent for sequencing to Macrogen, Korea. The 5.8S-ITS PCR products (5 μl) were digested with the restriction enzymes CfoI, HaeIII (Promega), and HinfI (New England Biolabs) according to the supplier conditions; these were incubated at 37 °C for 2.5 hr. The fragments were separated on a 3.5% agarose gel in 1x TAE for 2 h at 80 V. Band sizes were estimated by comparison with a 100-bp DNA marker (Thermo Scientific). For the identification of the obtained sequences, the Genbank database was used with the BLAST tool, http://www.ncbi.nlm.nih.gov/BLAST. For in silico characterization, RFLP restriction patterns were predicted by the Restriction Mapper program at: http://www.restrictionmapper.org/. Independently, flasks containing 50 mL of vinasse broth (medium) were inoculated with the yeast strains (102 CFU / mL); 77 strains were tested independently. After inoculation, the flasks were incubated at 23 ± 2 °C for 5 days and were maintained on a shaker at 150 rpm. After this time, total lipids (TL) were evaluated by the colorimetric Sulfo-Phospho-Vanillin (SPV) method; absorbance (A) at 520 nm was measured. Total Phosphorus (TF) was determined by acid digestion and absorbance (A) at 400 nm. Total protein (TP) content was determined by Biuret colorimetry; absorbance (A) at 595 nm was measured. All determinations were undertaken in triplicate. The determination of the lipid profile was undertaken in a gas chromatograph (Varian 2200 GC/MS, Varian CP-3800 GC & FID Detector) using a VF-23 ms, FS 60 m, 0.25 mm ID 0.25μ column (VARIAN). The fatty acids were derived as methyl esters, and 35 methyl ester analytical standards (Sigma) were used for the identification. The obtained data were submitted to statistical analysis using R. Data were analyzed using a one-way analysis of variance (ANOVA) and student’s-t tests. The differences observed at p ≤ 0.05 were considered significant. Based on the results of the metabolic analyses, the yeast strains PP1, PP21 and PR28 were selected to be tested as biofertilizers. Specifically, these strains had high nitrogen content (in protein) and high total phosphorus compared to the other strains (PP1: 1.4 ± 0.03 mg total phosphorus/g dry yeast and 130.5 ± 15 mg protein/g dry yeast. PP21: 0.9 ± 0.00 mg total phosphorus/g dry yeast and 251.3 ± 7.0 mg dry yeast protein/g. PR 28: 4.83 ± 0.01 mg of total phosphorus/g dry yeast and 124.9 ± 6 mg protein/g dry yeast). To test their utility as biofertilizers, each strain (102 CFU/mL) was cultivated in vinasse medium for 72 h, then the culture was centrifuged at 20,000 rpm for 20 min, and the obtained pellet was dried at 70 ºC for 72 h. This pellet was then ground to ≤ 0.1 cm, and the resulting powder constituted the respective biofertilizers (B1; B21; B28). To determine if the biofertilizers positively affected plant growth, they were added to bell pepper seedlings that were grown until the transplanting stage. Each plant was grown in 2 kg of volcanic ash soil with guano (49.4 g/tray) and NH4NO3 (42.1 g/tray) additions. B1, B21, B28 (24.6 g/tray), or no fertilizer (control) were added separately to each tray. Bell pepper seeds were added to each tray, which were kept in a greenhouse for 40 days with a 16 h light/8 h dark photoperiod, temperatures between 12 and 30 °C, and a water regimen of distilled water and monthly irrigation with Hoagland solution without nitrogen and phosphorus. Fifteen seedlings per control and treatment were measured in cm: the total length; long stem, long root and the number of true leaves were counted. The numerical results underwent analysis of variance and the Tukey test (p < 0.05) using the R program. The differences observed at p ≤ 0.05 were considered significant. From the sequencing of the 77 yeast strains, 10 unique taxa were found. Thus, the strains identified as a given taxon were grouped, yet the physiological characteristics of all 77 strains were determined to verify consistency within taxa. Regarding the assimilation of carbon (Table 1), the strain identified as P. fermentans (B27) had a carbon assimilation profile that was similar to that similar to that described by Kreger-van Rij (1994) for the same yeast specie. Interestingly, none of the strains from the present study were able to assimilate Inositol, and all were able to assimilate Glycerol. The strains grouped into the genus Kazachstania assimilated all of the tested carbon sources with the exception of Inositol, L-Rhamnose, and Salicin. Strains grouped in the Trichosporon genus differed in their carbon assimilation profiles. Specifically, PP2, PR11, and PR12 were identified as T. lignícola, yet the strain PR11 did not assimilate D-Arabinose, D-Ribose, Eritritol, or L-Rhamnose while PR12 and PP2 did assimilate these sugars. Regarding T. dulcitum, the strain PR27 did not assimilate D-Arabinose, D-Ribose, L-Arabinose, L-Rhamnose or compared to the other strains identified as T. dulcitum which did assimilate these sugars (PR1, PR3, PR4, PR5, PR8, PR10, PR23, PR24, PR25, PR26). 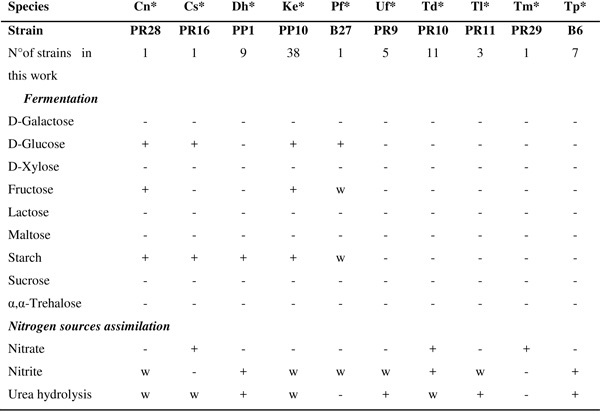 There were differences in the assimilation of some carbon sources by strains identified as T. porosum (PP4, B2, B3, B5, B6, B16, B21). Specifically, the strain PP4 was capable of assimilating D-Arabinose, D-Ribose, L-Rhamnose, Eritritol and Starch while the other strains weakly assimilated these sugars. The analysis of fermentation (Table 2) indicated that with the exception of D. hansenni, S. starkeyiihenricii, and strains grouped in the genus Trichosporon (T. ducitum; T. lignicola; T. miniiliforme and T. porosum), the other strains fermented Glucose. Further to this, species of the genus Trichosporon were unable to ferment other carbon sources. The strains PR16 and PR28 showed a weak positive assimilation of urea. Additionally, the strain PR16 positively assimilated nitrate while PR28 was not able to assimilate nitrate. Additionally, the carbon assimilation profile of the strains PR16 and PR28 were similar; both positively assimilated glucose. However these strains differed in the assimilation of nitrogenous compounds. *Abbreviations name yeast: Candida sp. (Cn), strain PR28; Candida saitoana (Cs), strain PR16; Devaryomyces hansenii (Dh), strains PP1, B1, B4, B7, B9, B18, B20, B26, B28; Kazachstania exigua (Ke), strains PP5, PP6, PP7, PP8, PP9, PP10, PP11, PP12, PP13, PP14, PP15, PP16, PP17, PP18, PP19, PP20, PP21, PP22, PP23, PP24, PP25, PP26, PP27, PP28, PP29, PP30, PR5, PR13, PR14, PR15, PR17, PR18, PR19, PR20, PR21, PR22, PR30, B29; Pichia fermentans (Pf), strain B27; Uncultured fungus (Uf), strains PR2, PR7, PR9, B10, B11; Trichosporon ducitum (Td), strains PR1, PR3, PR4, PR5, PR8, PR10, PR23, PR24, PR25, PR26, PR27; Trichoporon lignícola (Tl), strains PP2, PR11, PR12; Trichosporon miniiliforme (Tm), strain PR29; Trichosporon porosum (Tp) strains PP4, B2, B3, B5, B6, B16, B21. Scored for response to tests: negative = -, positive = ＋, weakly positive = w, positive or negative for one or more strains within the group = (-/+). Differences were found in the sizes of the amplified yeast ITS-5.8S rDNA regions; amplified fragments ranged in size from 421 to 678 bp. Additionally, ten distinct profiles (i.e. 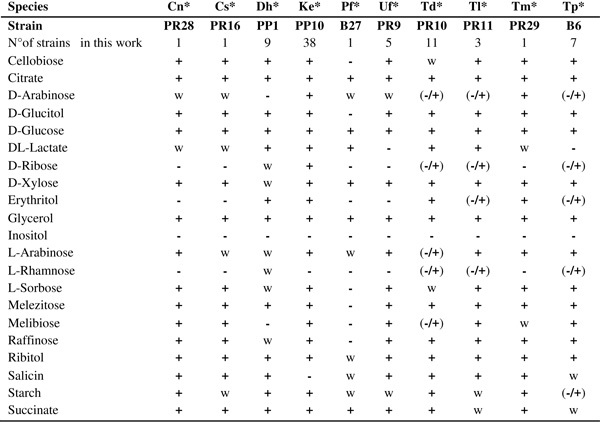 ten taxa) were found from the RFLP analysis with CfoI, HaeIII, and HinfI (see Table 3). Of these ten taxa, only four groups, C. saitoana, D.hansenii, K. exigua and P. fermentan, could be identified to species level by comparing the RFLP profiles to those available in the literature, (Esteve Zarzozo et al., 1999). Figure 1 shows the restriction profiles obtained for the yeast group with the greatest number of strains (38). Table 3. Identification of yeast strain, size of PCR products and fragments analysis of restriction of the 5.8S-ITS gene. *Yeast strains isolated in this work. In order to identify the unknown strains (those not identified by PCR-RFLP) and to confirm the identity of the others, the PCR products of 77 strains were sequenced and compared to those available in the GenBank database. 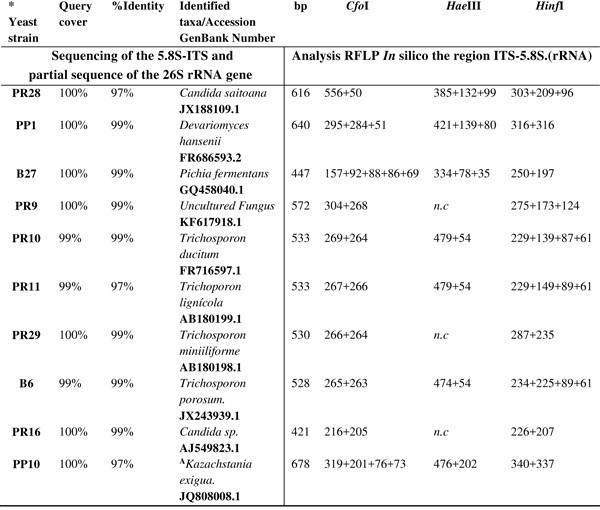 From this, the six groups unidentified using PCR-RFLP were identified as C. saitoana, T. ducitum, T. miniiliforme, T. lignícola, T. porosum, and S. starkeyiihenricii with greater than 99% max identity. Additionally, the identity of the strains identified using the RFLP method was confirm with the sequencing. The in silico RFLP analysis of the obtained sequences allowed us to identify the fragments that would have been obtained from the endonuclease cutting (Table 3) and to compare these with the empirically determined fragments (see Figure 1). The in silico restriction profiles for the following species C. saitoana; D. hansenii; K. exigua; P. fermentan; S. starkeyiihenricii and Candida sp. were clearly unique. This was not the case for species of the genus Trichosporon where, for example, the restriction patterns for T. dulcitum, T. lignícola andT. porosum were similar. For T. miniiliforme, although the in silico RFLP profile and profiles generated with the enzymes and cuts with the enzymes CfoI and HinfI were similar to those obtained for the other Trichosporon species, there was a clear difference in the restriction pattern obtained with the enzyme HaeIII where no cut occurred. After five days of incubation in vinasse, there was cellular growth of all of the strains (77); growth ranged from 0.18 g of yeast /L (strain PR27) to 5.58 g of yeast /L (strain B3). The strain PP12 had the highest amount of total phosphorous (1.55 mg/g of dry yeast), and the greatest amount of total proteins was found in strain PP4 (409 ± 18.5 mg of protein/g of dry yeast). Overall, statistically significant differences (p < 0.05) were found for all three parameters (growth, total phosphorous, and total amount of proteins). 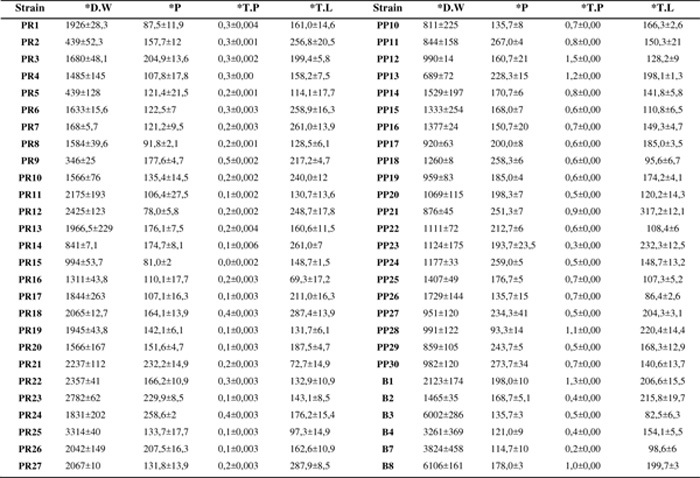 The highest values of lipid production were determined for the following strains PP1, PP4, PR4, PR10, PR27 and PR29. As such, these strains were selected as yeast with oleaginous potential. Overall, the statistical analysis indicated that there were statistically significant differences in production of lipids among strains (p < 0.005). The yeast selected to be cultivated in vinasse had an average of 214 ± 36 mg of lipids / g of dry yeast. The strain with the highest percentage of accumulation of lipids was PP4 (25.8% lipids with respect to its dry weight of 2.46 g/L, see Table 4a-b). According to the molecular identification, the strains selected for growth in vinasse belonged to the genera Devaryomyces (PP1) andTrichosporon (PP4, PR4, PR10, PR27 and PR29). Two strains, PP1 (Devaryomyces hansenii) and PR27 (Trichosporon dulcitum) were selected for lipid profile analysis. From this, it was found that 34 % of the fatty acids of PP1 and 33 % of the fatty acids of PR27 ((Woleic acid /W fatty acids total)*100) were C18:1 oleic acids (cis9). (mg/g dry yeast); T.L = Total lipid (mg/g dry yeast). The yeast strains that were tested for potential use as biofertilizers were PP1, PP21, and PR28, which were identified as the following genera Devaryomyces, Kazachstania,and Candida, respectively. The strain PP1 had 1.4 ± 0.03 mg of total phosphorous/ g of dry yeast and 130.46 ± 0.5 mg of protein/ g of dry yeast. The strain PP21 had 0.87 ± 0.06 mg of total phosphorous/ g dry yeast and 251.3 ± 3.6 mg of protein/ g of dry yeast. The strain PR28 was found to have 4.83 ± 0.01 mg of total phosphorous/ g of dry yeast and 124.93 ± 12.73 mg of protein/g of dry yeast. The potential use of these strains (PP1, PP21, and PP28) as biofertilizers was determined by measuring the morphometric parameters of bell pepper seedlings suitable for transplantation. The highest mean total length (9.53 ± 0.85 cm) was found for bell pepper seedlings grown in the control soil (Figure 2A), and there were significant differences (p < 0.05) in the mean total length of these seedlings compared to those grown in guano and with B28 and B1 addition. The highest average stem length (5.66 ± 0.99 cm) was found in seedlings treated with B1 (Figure 2B); there were significant differences (p < 0.05) in the average stem length of plants fertilized with guano and with additions of B1, B21, and B28 compared to plants grown in the control soil and those fertilized with NH4NO3. The highest mean root length (5.6 ± 1.59 cm) was found in seedlings fertilized with NH4NO3 (Figure 2C), and these values differed significantly (p < 0.05) from the mean root length of plants fertilized with B1; B21 and B28. Lastly, the highest average number of leaves 3.93 ± 0.70 was recorded for bell pepper seedlings treated with B1. This study demonstrates that physiological analysis and molecular characterization using PCR-RFLPs and sequencing are useful tools for the identification of yeast, and this, in turn, can facilitate the development of biotechnological applications for these microorganisms. The assimilation and fermentation profiles obtained from the physiological characterization of these yeasts were similar with those described in the literature for yeast reference strains. For example, the assimilation of carbon by the strain P. fermentans (B27) was similar to that found by Caputo et al. (2012). Furthermore, all of the strains identified as belonging to the genus Kazachstania assimilated the tested carbon sources with the exception of Inositol, L-Rhamnose, and Salicin. These results are similar to those obtained by Liu et al. (2008) for K. exigua. The carbon assimilation profiles differed among species from the genus Trichosporon. For example, the strain PR27 identified as T. dulcitum did not assimilate D-Arabinose, D-Ribose, L-Arabinosa, Ramhnosa, or Melibiosa while the other strains identified as this species (PR1, PR3, PR4, PR5, PR8, PR10, PR23, PR24, PR25, PR26) did assimilate these sugars. Regardless, the carbon assimilation profiles of some T. dulcitum reference strains [CBS 8257, CBS 5785, CBS 5786, CBS 7608, CBS 8258 (http://www.cbs.knaw.nl/)]also differ. Differences were also found among the strains identified as T. porosum (PP4, B2, B3, B5, B6, B16, B21). Specifically, the strain PP4 positively assimilated D-Arabinosa, D-Ribosa, L-Rhamnose, Erythritol and Starch, while the other strains minimally assimilated these sugars. These results are similar to those presented by Middelhoven et al. (2001) for T. porosum (reference strains: CBS 2040, 8396, 8397 and 8522) only that in the mentioned study starch is positively assimilated. Colombo et al. (2011) suggest that these differences between strains depend on the source from which the strains are isolated. Regarding the fermentation of carbon sources, the results presented here indicate that all of the studied strains (77) ferment glucose with the exception of D. hansenni, S. starkeyiihenricii, and strains identified as belonging to the genus Trichosporon (T. ducitum, T. lignícola, T. miiniliforme and T. porosum). With respect to the genus Candida, Yan et al. (2014) have shown that Candida mycoderma obtained from soil from rice cultivation in the Jiangxi province of Chine assimilate nitrogen compounds including KNO3 and Urea. Similarly, Kurztman et al. (2011) indicate that strains from the genus Candida can be nitrate positive or negative and usually do not hydrolyze Urea. The strains PR16 and PR28 were weakly positive for Urea. Additionally, the strain PR16 positively assimilated nitrate, while PR28 did not. With respect to the yeast identification, there are many molecular techniques that employ the use of rDNA gene sequences and/ or ITS regions (Honnavar et al., 2016). Recently, the use of mitochondrial DNA (mtDNA) and ribosomal DNA (RFLP) has been widespread (Kopecká et al., 2016). Here, both RFLP analysis and ribosomal DNA sequencing were used for the identification of yeast. Differences were found in the sizes of the amplified ITS-5.8S regions of the yeast strains (regions ranged in size from 421 to 678 bp). Taking into account this variability, the 77 strains analyzed here clustered into ten unique groups according to the RFLP profiles. Of these ten groups, four could be identified to species level, and one group could be identified to the genus level (D. hansenii, P. fermentan, K. exigua, Candida sp.). Despite this, it has been shown that restriction profiles often do not differ drastically, thus identification to the species level is complicated (Segura et al., 2010). This was the case for the restriction profiles for strains identified as belonging to the genus Trichosporon. In order to further resolve these profiles, other restriction enzymes should be used to differentiate the strains. Alternatively, sequencing other DNA regions, such as intergenic spaces (IGS) located within 26S and 18S, would help resolve species identifications (Romero et al., 2005). At the very least, similarity in the restriction patterns of closely related species is to be expected. Middelhoven et al. (2001) have shown that the ITS-5.8S is highly homologous in species of the genus Trichosporon; thus, this genus is considered phylogenetically monophyletic. Further to this, Segura et al. (2010) reports that the RFLP band patterns for the yeast species Kuyvemyces lactis and Kluveromyces marcianus are very similar, thus correct identification using RFLPs or morphophysiological measurements is complicated. The restriction patterns for the strains identified to the genus Kazachstania were similar to those obtained in other studies (for examples see Pham et al., 2011 and Esteve-Zarzoso et al., 1999). Following the identification and characterization of the yeast strains, we found that K. exigua was the most abundant species in our samples; this species represented 38% of all of the strains isolated from the Hapludand soils, and it was most prevalent in PP soils. As described by Yurkov et al. (2012), yeasts of the genus Kazaschtania have been reported in many types of soil including those originating from forests and prairies subjected to different types of management. Likewise, Liu et al. (2008) present a new species of the genus Kazaschtania from soil from Taiwan. The yeast species that mainly dominated the B soils were D. hansenii, T. porosum, T. dulcitum and S. starkeyihenricii. In their study conducted in Andian Patagonian forests in Argentina, Mestre et al. (2011) have shown that the species T. dulcitum and T. porosum actively participate in the decomposition, degradation, and mineralization of plant material. The results obtained here also support the finding that T. dulcitum, T. porosum, and Cryptococcus Podzolicus are involved in the decomposition of complex polysaccharides and some aromatic compounds (Yurkov et al., 2012). Additionally, it has been described that yeast belonging to the following genera Candida, Cryptococcus, Rhodotorula, Sporobolomyces, Trichosporon, Williopsis and Yarrowia are capable of directly increasing plant growth (Botha, 2011). Strains identified as belonging to the genus Kazachstania were most abundant in the PP soil (87% of the strains isolated from the PP samples). This is consistent with results found by Yurkov et al. (2012) that show that with increased intensity of soil management there is a greater proportion of Ascomycete yeast. Overall, two possible biotechnological applications, the production of lipids and use as biofertilizers, have been identified for the yeast isolated in the present study (see Table 4). Specifically, lipid-producing yeast could present an alternative for the production of biodiesel. In the present study, the strains PP1, PP4, PR4, PR10, PR27 Y PR29 had the highest values of lipid production. According to the molecular identification, these strains are classified as D. hansenni (PP1) and belonging to the genus Trichosporon (PP4, PR4, PR10, PR27 and PR29). Interestingly, Breuer and Harms (2006) have indicated that D. hansenni is metabolically versatile yeast that is osmotolerant, non-pathogenic, and has the capacity to accumulate lipids. Thus, these authors indicate that this microorganism is attractive from a biotechnological viewpoint. Upon cultivating a new strain of Devaryomyces etchellsii in limited nitrogen conditions, Arous et al. (2015) found an increase in lipids from the vegetative stage (11.9%) to ascoporogenesis (22.4%). Here it was found that the strain PP1 identified as D. hansenni was able to accumulate 22.2% of lipids when grown in vinasse. Some studies have also noted the ability to accumulate lipids by species of the genus Trichosporon. For example, Gao et al. (2014) found a high accumulation of lipids 12.3g of lipids/ L of hydrolyzed lignocellulose with respect to dry cellular biomass (38.4 g) in Trichosporon cutaneum ACCC 20271 when grown in a corncob media (lignocellulose residue). These values are quite high considering that the cultivation media was a lignocellulose residue, which are known to contain inhibitors (see Kumar et al., 2017). In the present study, after six days of incubation in vinasse, 11.3 g of yeast /L of vinasse were obtained, and the yeast was composed of 30% lipids. 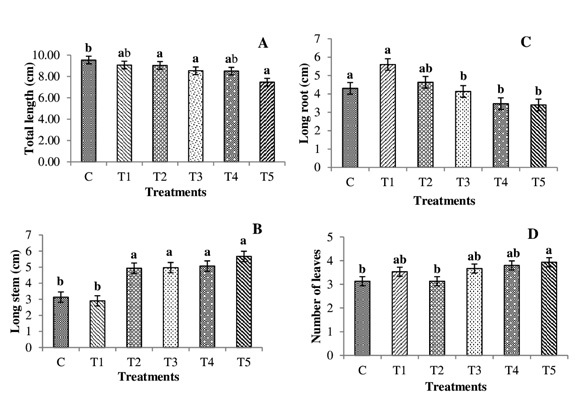 Another study evaluating the yeast Trichosporon oleaginosus grown in sewage treatment sludge (thermally and chemically pretreated) found a lipid content of 39% (Zhang et al., 2014). Here the highest lipid content obtained for strains of the genus Trichosporon was found for the strains PP4 and PR27 (25.8 and 21.6%, respectively). Finally, two strains were selected for lipid profile analysis, these included PP1 identified as D. hansenni and PR27 identified as T. dulcitum. From this, it was found that strain PP1 had 34% ((Woleic acid /Wtotal fatty acids)*100) oleic acid C18:1 (cis9) while strain PR27 had 33% oleic acid. The composition of these oils indicates that they are suitable as raw material for the production of biodiesel (Soccol et al., 2017). The strains PP1 (D. hansenii), PP21 (K. exigua), and PR28 (Candida sp.) were tested for potential use as biofertilizers, and interestingly it has reported that yeast of these genera are promoters of plant growth due to their production of different biomolecules. For example, Fu et al. (2016) have isolated 15 species of growth promoting yeast from the phylosphere and rhizosphere of the plant Drosera spatulata Lab., and these 15 species include Kazachstania jiainicus (FJ196732) and Candida akabanensis (EU100744). Yet other studies demonstrate the capacity of isolated yeast, including Kazachstania siamensis LM002 and Candida sirachaensis LM068, to biosynthesize, Indole-3-Acetic Acid (IAA) (43.3 mg/L IAA and 31.9 mg/L IAA, respectively). Furthermore, Narsian et al. (2010) isolated 25 yeast strains and six of these belonging to the genera Saccharomyces; Hansenula; Klockera; Rhodotorula and Debaryomyces had the highest solubilization indices (ranging from 1.33 to 1.50) when the yeasts were examined in vitro with tricalcium phosphate and rock phosphate. Other studies evaluating the effect of the solubilization of phosphates on the growth of plants have found that inoculation with phosphate solubilizing microorganisms (bacterium) produces increase biomass compared to that found for plants that were not inoculated (Sharon et al., 2016). Here it was found that adding yeast to bell pepper seedlings mainly promoted an increase in the number of leaves and an increase in root size produced by the plants (Figure 2). Interestingly, others have found similar effects on root size and number of lateral roots for bean seedlings (Gupta et al., 2016). This study has provided initial information on yeast associated with soil with different agricultural management in the region of Los Ríos, Chile. The PCR-RFLP methodology was found to be an appropriate technique (fast and reliable) for the identification of yeast. Despite this, not all RFLP profiles were resolvable, thus not all identifications could be performed. Regardless, when complemented with the sequencing of yeast DNA, the identification of the strains was achieved, and sequencing also confirmed the identifications using the PCR-RFLP methodology. In addition, the physiological characteristics of native yeasts of southern Chile are presented here. Thus, a preliminary evaluation of their biotechnological potential as biofertilizers or for lipid production is given; however, future more detailed studies are warranted to better determine the application of these yeasts to industry. The authors thank the FONDECYT 1141066 project and the National Doctorate Scholarship Number: 21140135, CONICYT. Kurztman, C.P., Fell, J.W., Boekhout, T. 2011. The yeasts a taxonomic study. The Fifth Edition. Elsevier. Pham, T., Wimalasena, T., Box, W.G., Koivuranta, K., Storgårds, E., Smart, K.A., Gibson, B.R. 2011. Evaluation of ITS PCR and RFLP for differentiation and identification of brewing yeast and brewery ‘wild’ yeast contaminants. J. Inst. Brew. 117, 556568.